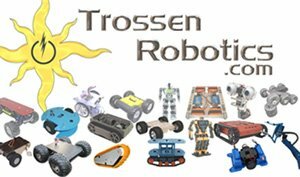 Matt Trossen has opened a new website, TrossenRobotic.com to supply all the needs of robot builders and hackers. The store includes pretty much everything you need to build robots from complete kits to all the sensors, components, brackets, nuts and bolts you might need. He promises in the future to serve up some robotics development software using XML to be platform independent. He plans to set up forums and libraries where people can trade tips and re-useable robot code. They are very enthusiastic about supporting robot development so you can expect to see lots of new stuff from them in the coming months. Nice, they do have encoders. But we need a supply of <$10 encoders from somewhere. If they can build mice for that cheap, there must be a way for robots to get them as well.